Now that you know I'm in India speaking at the first annual Great Indian Developer Summit, it's time to move on and start doing some presentation wrap-ups. 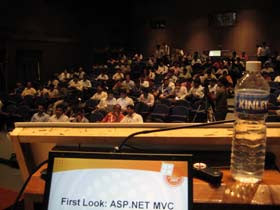 As I mentioned in yesterday's post, I've so far delivered three focused sessions on three relatively new Microsoft technologies- ASP.NET AJAX, ASP.NET MVC, and WPF. These topics are clearly of great interest to the local .NET community as every one of my talks (except for the first, which was in the keynote main hall) were filled to capacity, standing room only. Even my first talk in the keynote hall was easily attended by over 300 people. Needless to say, the turnout is great. For everyone here in India that attended one (or all, as I've had some people report) of my sessions, thank you very much for coming out and being a great audience. I know I can speak fast, so hopefully I wasn't too hard to understand. If I was, you were all very polite and faked enjoying my presentations well! For everyone that couldn't make it to India for my presentations (I know there are a few of you out there), you can find the slides and demo code from my presentations at the bottom of this post. Some of the demos, especially those borrowed from Interknowlogy (like the 3d WPF apps and the XAML Cruncher tool), I'll omit from my downloads, but you can find links to download them yourself on Tim Huckaby's blog. I also can't make the Telerik RadControls for WPF "sneak peak" available for download right now, but watch for a public beta right before TechEd (I'll announce it on this blog). Otherwise, I hope you can take away some useful tips from these decks and find practical help for diving deeper in to these emerging and maturing technologies. Watch for another update soon with the slides and code from today's Silverlight deep dive. ah.. missed your session on SilverLight as was I stuck with some work. Hoping to see you tomorrow.N thanks for all the slides and code. Well i followed u strictly for the past 2 days. Was really a nice experience and ofcourse avery useful one. The things shared would be useful for my pals back at home. I thinks thats not functional. Awaiting the attachments for the Silverlight Deep Dive 2.0 Session. Thanks for all your sessions in the Dev Summit. The knowledge you have shared will really help me for my upcoming projects. Awaiting for slides and codes the the sliverlight deep drive session. I was at two of your talks - WPF and the Silverlight Deep Dive workshop. I have been wanting to let you know how much I enjoyed and was inspired by your talks, but the Great Indian Developer Summit has been keeping me on my toes (I have a Golden Pass) by bombarding me with so many quality sessions and speakers that I have found time only now to let you know. I am sure I will go back to work next week a very enriched after this wonderful experience at the summit. Thanks again and I look forward to more updates as promised in your post. Look forward to see you again. @All- Thanks so much for the positive feedback. I'm honored that you enjoyed my sessions and that you found them helpful. You were all great to meet and I look forward to meeting again. @puneet- I checked the link to Tim's blog and it seems to work. Double-check your connection and let me know if you still have trouble. Maybe I can send you some alternate links. "Error 2 The name 'RenderView' does not exist in the current context C:\Documents and Settings\jchawla\Desktop\DemoMvcSite\DemoMvcSite\Controllers\SupportController.cs 30 13 DemoMvcSite"
Is there something I need to add to this class to make this run? @Anon- The problem is likely that you have a newer version of the MVC framework installed than was used for this demo. MVC has introduced breaking changes from version to version, so if you're on the latest bits, that's probably the problem. To fix it, I think you should be able to quickly Google the error and find the "new" MVC syntax that you need. I'll try to update the demo, too, so you have that as a reference. Thanks for highlighting the issue! 1. In controllers methods which returns ActionResult now instead of void, change the "RenderView" to "View"
2. I also had to add Microsoft.Web.Mvc to get this to work. 3. In views, we now have to write ViewData.Model instead of only ViewData to get list of users. I am still very new to asp.net mvc and trying to understand what each of these changes exactly means. Another question that I have for you is, that whenever I run the project it goes to default page which does not have anything? Was that intentional for the demo? @Anon- Thanks for posting the steps required to update the demo for the latest MVC framework beta. I'll try to post updated coded soon. The blank default page was another MVC framework default item (at least it was back then). It was added to "help" IIS navigate to the default controller when the root URL was accessed (you should see simple redirect logic in the page).